Christopher finds a kitten on his doorstep, which, to his surprise, grows up into a lion! Since Christopher already loves his pet, he tries to introduce him to his everyday life, much to the horror of his friends, family, and neighbors. 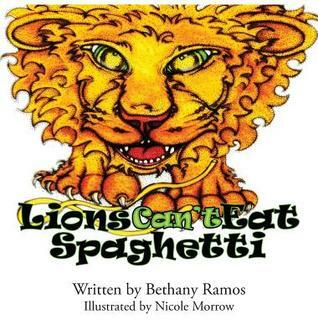 Lions Can't Eat Spaghetti is a lighthearted children's book for ages 3 to 6 that celebrates the special bond that all children have with animals. This is such a sweat story about a little boy and his stray "kitty" that ends up actually being a baby lion. Sadly, as the cub grows up the boy must learn that even though he loves his cub dearly, it is not safe for him or his beloved lion to keep him any longer. In a way the book is a little heart breaking, but it has a wonderful message to it that is essential to life. Sometimes the things we love the most in the world, are not necessarily good for us and we have to let go out of love. This book really hit home for my son whose father had to go away a few months ago due to drug and alcohol abuse. He obviously did not want to let him go and be away from his father, but for everyone's safety and because we love him, we needed to do what was best. This book made a great tie in for my son that he could relate to the little boy and loving someone so much, but needing to let go. Great book overall that is easy to recommend that has a positive message, with excellent illustrations that tie the story together. 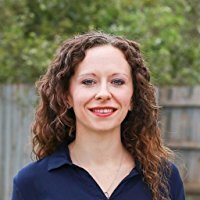 Bethany Ramos is a children’s book author, editor, and blogger. She is a regular contributor to SheKnows.com. Bethany’s first children’s book, Lions Can’t Eat Spaghetti, was published through 4RV Publishing in 2016. Her second children’s book, There’s a Bumbie Under My Bed, was published by Saturn’s Moon Press, also in 2016. Her first chick lit novel, 5 Stages of Grief, was published by Black Opal Books in 2011; her second chick lit novel, Adventure to Love, was published by Soul Mate Publishing in 2013. 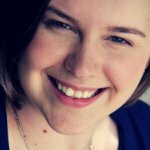 Bethany works as Editor in Chief for Naturally Healthy Publications. Their lives are perfect& if only from the outside. At first glance, the residents of Herald Springs lead charmed lives. But behind the dazzling smiles and inside the large brick homes, they all have their secrets. Most are harmless, but then again Annabeth King never did quite fit in. This newest neighbor is harboring a special secret of her own, one that could prove deadly. Will the members of the drink and gossip club figure out what Annabeth s working so hard to hide before disaster comes knocking? With Storm s signature bitter-sweetness and Hodge s thrilling intensity, Walker Texas Wife offers a fast-paced, addictive romp that fans of Desperate Housewives and Pretty Little Liars will find themselves falling hard and fast for. This debut in the new Book Cellar Mystery series will leave you wondering: just how well do we know our neighbors after all? Ok I'll be perfect;y honest here. When I first saw this title I have to admit Walker Texas Ranger was the first thing that popped into my mind. I am from Dallas after all! So needless to say, what I expected was not what I got with this book by a long shot! This is the first of a new series by two authors who are new to me. This book is a collaboration between two authors and I must say they did an amazing job. I loved Vi, Anabeth, Marcus, Brook, all of them. The complexity of the characters and was a pleasantly surprised with this novel. So many character are glossed over these days and it was nice to read a book with some depth to both the minor and major players. I must have read this book in a day and now i am itching to read the next book in this series, "Texas and Tiaras". I was really drawn in and then at the end...bam..epic cliff hanger that they dangled in front of you like a carrot. I would definitely recommend this book to any avid readers of the genre, you will without a doubt fall in love with this one! I received a complimentary ARC from the author in exchange for my honest review. Disclaimer: I received a free copy of this book from the author is exchange for my honest review.